How Much Snow Can a Roof Hold? | Modernistic - Simple and Quick! Sigh. I was so ready for spring, but Michigan had other plans! This is quite the storm we have going on, and we’re getting buried in more and more snow. Every winter we can count on tons of the white stuff falling on our heads, and unfortunately there’s not much we can do about it. In terms of snowfall, we’re no Alaska, but we are close! According to USA.com, we average a mere 4 fewer inches of snowfall per year than Alaska. Only 4! A little over 60 inches of snow falls on those of us living in Detroit, Lansing, Grand Rapids, Flint, Holland, Muskegon, Kalamazoo, Battle Creek, Jackson, Livingston, and the rest of our fair state. This of course presents a unique set of problems that people living in, say, Florida (0.01 inches/year), never have to worry about. One of the worst of these problems that snow creates has to do with the structural integrity of our homes; namely, our roofs. How much snow does it take to cave in a roof? When do you have to worry about climbing up there and removing the snow accumulation? To get an accurate measurement, we need to think in pounds per square foot. The average roof supports around 20 pounds per square foot before being considered stressed. Keep that number in mind. You definitely don’t want to exceed that limit. After a large snowfall, take a look at the accumulation on your roof. One foot of fresh snowfall equals about 5 lbs/sqft, well below our 20 lbs/sqft “danger zone.” So unless you had the storm of the century dumping 4 feet of fresh snow on your roof, you should be safe! What’s more common, of course, is a mixture of old and new snow on the average roof in winter. 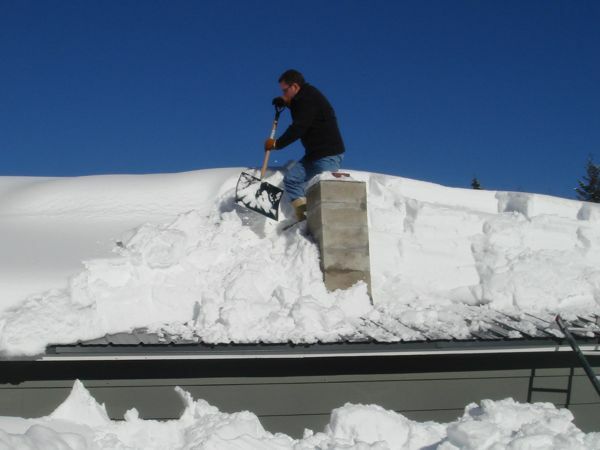 Old, packed snow weighs up to 12 lbs/sqft, so you should definitely remove any old accumulation around two feet to prevent potential roof damage. If you’re unlucky enough to experience an ice storm or freezing rain this winter, you definitely want to watch your roof carefully. 1 inch of ice weighs the same as 1 foot of fresh snow (5 lbs/sqft). Any ice accumulation over 4 inches puts your home at risk for a roof collapse! The consequences of a collapsed roof are varied, but each one is a separate headache. Any amount of structural damage needs to be addressed quickly; otherwise you run the risk of moisture entering your home, which can lead to a host of other problems. If you do experience a roof leak, or any other moisture-related issue, a certified professional can help! Modernistic is standing by 24/7 for these types of emergencies this winter, next winter, and each winter beyond.